A Fish and Wildlife veterinarian said the exam produced no significant findings to indicate why the cougar killed one bicyclist and injured a second on May 19. 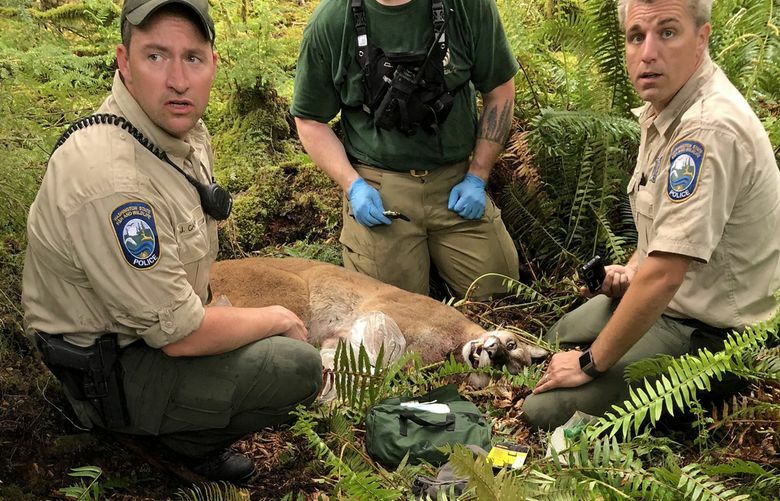 SEATTLE (AP) — Officials say an examination of the cougar believed to have killed one mountain biker and injured another near North Bend found no abnormalities that might have contributed to the animal’s unusual behavior. The Washington Department of Fish and Wildfire on Monday released the report done by Washington State University on the cougar’s carcass. Fish and Wildlife veterinarian Dr. Kristin Mansfield said the exam produced no significant findings to indicate why the cougar attacked the S.J. Brooks and Isaac Sederbaum May 19. Brooks died and Sederbaum was injured. She says wildlife managers are confident that the approximately 3-year-old cougar was involved but are waiting for DNA analysis to confirm that conclusion. Mansfield says the animal was lean but within a normal range. She also said no indication was found of rabies or other diseases that would pose a risk to humans.